SAMUEL F. CODY Signed Photograph. Samuel Franklin Cowdrey (later known as Colonel Sam Cody). American born pioneer aviator, wild-west showman and inventor. Made the first powered flight in Britain in 1908. Photograph signed. 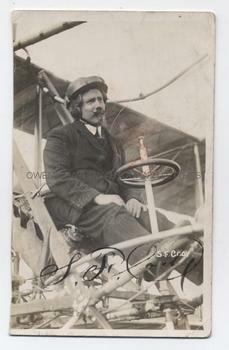 The photograph is a real photograph post-card by the Topical Postcard Co and shows Samuel F. Cody, full length, seated at the controls of his Cody Biplane No.5A. 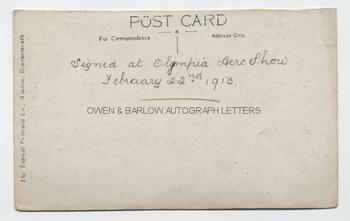 A note on the reverse of the card states that this was signed by Cody at the Olympia Aero-Show on February 22nd 1913. A nice image, signed boldly in black ink. The photograph measures approx. 5.5 x 3.5 inches. It has been slightly trimmed at the left side with loss of the white border but without loss to image. All else fine. Samuel F. Cody was born in Iowa, USA, where he had been a cowboy and had taken part in the Klondike gold-rush. He came to England with his wife Maud, with whom he had a shooting act as part of a touring wild-west show. He became estranged from his wife who returned to America but Cody remained in England where he lived with a Mrs King and the children he subsequently fathered. The family toured the music halls with a riding, shooting and lassoing act. In 1901, Samuel F. Cody patented the first of his large kite designs which quickly came to the attention of the British Admiralty as being potentially useful for military observation platforms. He next turned his attention to gliders, based on his large box kites and, subsequently, to powered aircraft. On 5th October1908, he made the first powered flight in Britain of a heavier than air machine. The section of the Royal Engineers that he undertook to form went on to become No.1 Squadron of the RFC and subsequently No.1 Squadron Royal Air Force and he can justly lay claim to being the father of powered flight in the UK. Samuel F. Cody was killed in a flying accident in August 1913, only 6 months after this photograph was signed.